Christmas is just around the corner and Winter has definitely arrived. If you’re anything like me and do everything you can to keep to yourself as snug as a bug without your heating bill soaring, these tips should help. Don’t block the radiator: Arrange your furniture away from radiators so when the heating comes on you feel the full effect. Block the drafts: The gaps under doors, windows that don’t shut properly, your keyhole and the letter box are all guilty of letting the cold in. Make your own with a pillowcase stuffed with old tights or socks to block the gap under your doors. Alternatively get some cheap self-adhesive foam strips to stop the drafts at the windows. Shut the curtains: One of the most important things to prevent heat loss in the home, yet the most simple is shutting the curtains to help keep the heat in and appear cosier. Hot water bottle: Fill up a rubber hot water bottle and slip it between your sheets about 30 minutes before you go to bed or simply keep it on your lap and you’ll feel warm all evening. Slippers: If your feet are cold, chances are the rest of your body will feel cold too, so pop on a pair of socks or slippers. Drink up: Drinking a warm fluid makes your core body temperature increase, making you feel much warmer all over, especially your hands and fingers. Don’t heat unused rooms: If the room is empty for long periods of time just turn the radiators off or keep them on the lowest setting. Keep the doors shut to the rooms you are not heating as they will bring down the temperature of the used ones. Layers: You’d assume that one big thick jumper would do the trick but actually you’re more likely to feel warmer if you wear a few layers of clothing including tights, leggings etc. 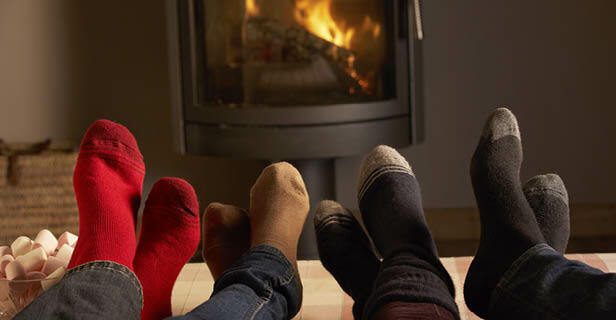 What do you do to keep warm inside your home? We’d love to hear your tips.